When I hear of a meal consisting of turkey, I automatically think about serving it at Christmas, Thanksgiving, or Easter. Honestly, I don’t know why, it’s not as if a turkey is only available in the supermarkets during those months! It’s time I change my my way of thinking about when to cook and eat a turkey. After all, it’s so delicious, why not serve it year round to my family! I noticed at the grocery store that I can purchase different cuts like ground turkey, breast filet or steak, stir fry strips, drumsticks, thigh joint, and many more. Lately, I made meatballs using ground turkey with a spaghetti sauce and my family just loved them! Turkey can be cooked any time of the year, especially during the summer months and on the BBQ too! Salt a large pot of water with 1 tbsp salt and bring to boil. Prepare rapini by rinsing thoroughly and trimming stems. Boil rapini for 5 minutes and remove from water. Salt another large pot of water with the other 1 tbsp of salt and cook pasta according to package instructions. Grill sausages over medium heat until cooked through, 8-10 minutes. Heat a frying pan with 2 tbsps olive oil over medium heat. Add rapini, salt to taste, pepper, hot pepper and garlic to large frying pan. Saute over medium heat until cooked through, 3-4 minutes. Add pasta, 2 tbsps of olive oil and sausages to rapini mixture. Turkey Farmers of Canada recently launched a new logo and website called Canadian Turkey! You can visit it to find more delicious recipes! Summer is here and we are super excited about cooking with Canadian turkey. Summer is the perfect season to cook, eat, and grill our favorite bird. It’s a light and lean source of protein, perfect for those hot summer days. It’s packed with vitamins and essential nutrients, making it a healthy choice for your family, and it’s easy to prepare with a variety of cuts available. Turkey is fantastic on the grill, and you can find ground meat, burgers, and sausages at your local grocery store. It’s a great everyday choice and we’d love to see it on Canadian tables for regular weeknight meals! This summer, why not get a whole bird on the grill? Canadian turkey is great barbequed whole or cut down into parts. Your butcher can help break it down to make the process even easier. The best thing is that one turkey can feed a big crowd, so it’s economical, too! There are so many ways to eat it, and it’s perfect hot or cold, so your barbequed bird will go a long way! Ask for Canadian raised Turkey next time you’re grocery shopping so you know you’re putting Canadian quality on your table – from our farmers’ families to yours! For more information about Canadian Turkey, you can connect with them on their Facebook, Twitter (hashtag #FreshIdea), YouTube, and Pinterest pages! Canadian Turkey wants for one lucky Ottawa Mommy Club reader to win a $75 Prepaid Visa Gift Card to purchase a turkey and all the ingredients to make a delicious family meal this summer! The ARV of this prize is $75! This giveaway is open to Canadian residents and ends at 11:59 EDT on July 25th, 2016. I would like to try the Turkey Taco Pizza recipe. I would like to try the BBQ TURKEY CLUB WITH SPICY MAYO sound and looks delicious. I would like to try the turkey with pasta recipe. I’dx like to try the BBQ Turkey club with spicy mayo. I like to try the THAI GREEN CURRY TURKEY STIR FRY. Would love the Potato-Topped Turkey Meatloaf Bites. I would like to try the Turkey Tacos Pizza. The BBQ Turkey Club with Spicy Mayo looks yummy. i would love to try the turkey tacos or the curry, both sounds delicious! TURKEY NICOISE SALAD WITH SUNDRIED TOMATO DRESSING, as it would be great for a summer picnic! I’d like to try the grilled apple and honey turkey. I would like to try the Honey Sriracha Turkey Blue Cheese Quichettes. I’d like to try the TURKEY TORTILLA CONES recipe. I’d like to try the TURKEY TORTILLA CONES recipe. It looks delicious. I’d like to try the Turkey Taco Pizza recipe. The spiced fried turkey nuggets sound delish! I would like to try the Turkey Taco Recipe. I would like to try the smoked turkey wraps! I’d like to try the BBQ Turkey club with spicy mayo. The Spiced Fried Turkey ‘Nuggets’ Recipe sounds really good and I would try it first.I had no idea there were so many delicious ways to serve turkey. I’d like to try the HONEY GARLIC TURKEY TENDERS WITH SWEET AND SMOKY DIPPING SAUCE. Would definitely try the Turkey and mushroom pesto burger. The stuffed Mexican Turkey bites look really cool, like no other recipe I’ve seen before! I would like to try the BBQ TURKEY CLUB WITH SPICY MAYO. It looks really good. I will definitely be trying the Sweet Chili & Lime Turkey Meatballs! I’ll try the GRILLED TURKEY THIGH TACO BOWLS but with tempeh instead, since i’m Vegan. The BBQ TURKEY CLUB WITH SPICY MAYO looks simply delicious. The TURKEY CROQUE MONSIEUR WITH CRANBERRY-APPLE CHUTNEY looks like a meal that I would love to try. I;d like to try the turkey and pasta recipe. I would like to try the Smoked Turkey Wraps. I would try the BBQ Turkey Club. 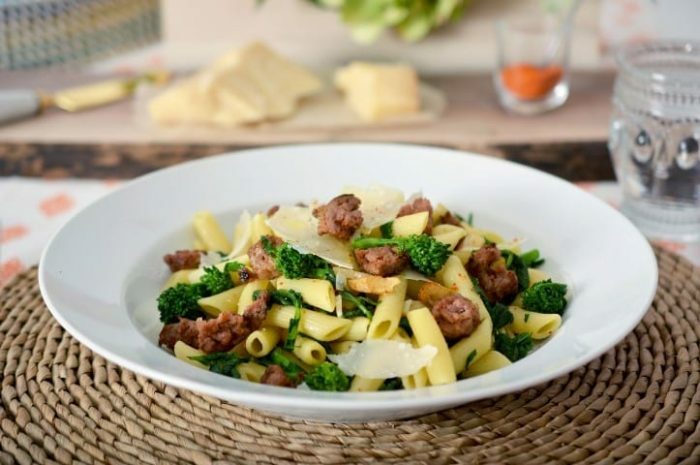 I would like to try out the Turkey Sausage and Rapini Pasta recipe for sure. The TURKEY APPLE CHEDDAR PATTY MELTS look amazing. I want to try the BBQ turkey club with spicy mayo. I would love to try the POTATO-TOPPED TURKEY MEATLOAF BITES. They look and sound so good. I would like to try the BBQ Turkey Club with Spicy Mayo as it looks so good! Would have to be the tacos. I would like to try the Spicy Fried Turkey Nuggets! I would like the shredded turkey tacos. So hard to decide but I am in the mood for a sandwich so would like to try the Curried Turkey and Apple Sandwiches. I’d like to try the bbq turkey club! I’d like to try the THAI GREEN CURRY TURKEY STIR FRY, love curry. I would love to try the Turkey Taquitos! I like the TURKEY NICOISE SALAD WITH SUNDRIED TOMATO DRESSING. i’d love to try the Monte Cristo Melt recipe. BBQ Turkey Club with Spicy Mayo – looks awesome!! I would love to try the Potato-Topped Turkey Meatloaf Bites. Seems simple enough, but still interesting and delicious. I would like to try Potato topped turkey meatloaf. Grilled turkey thigh taco bowls! My mouth is watering just thinking about it ;). I would like to try the Grilled Turkey and Mushroom Pesto Burgers! I’d like to try out the shredded turkey tacos. I want to try the Shredded turkey tacos-yum! I’m a burger person, so the grilled turkey and mushroom pesto burger! Great Scout , Marty My fave:shredded turkey tacos. Pick me, pick me! Your next winner!!! Show me the money!!! It would be a dream come true and means more to me than anyone else to win. Starving artist here desperately needs the Visa gc to shop and eat. Winner, winnner. Chicken dinner. A life changing experience. Top of my bucket list. Thank you for the awesomeness, the contest, and generosity. Dear Santa: I’ve been nice. My X-Mas wish this year is to win this contest. http://www.canadianturkey.ca/recipes/auto-draft-3/ BBQ Turkey Club looks delish! I would like to try the Spiced Fried Turkey Nuggets. I would love to try the BBQ TURKEY CLUB WITH SPICY MAYO, it looks so good! I’d like to try the turkey club – it’s my favourite sandwich! I’d love to try the TZATZIKI TURKEY CUCUMBER & CREAM CHEESE SANDWICH recipe. It looks and sounds delicious. I would love to try out the BBQ TURKEY CLUB WITH SPICY MAYO. It sounds yum! I would love to try the GRILLED TURKEY AND MUSHROOM PESTO BURGERS!! It looks so delicious as do all the other recipes for turkey. That’s an impressive recipe file to refer to!! I’d like to try the GRILLED TURKEY AND MUSHROOM PESTO BURGERS. I have to try the BBQ Turkey Club with Spicey Mayo recipe. wow this one looks sooo good . I would like to try the Thai Green Curry Turkey Stir Fry. Slow Cooker Turkey Breast is calling my name. BBQ TURKEY CLUB WITH SPICY MAYO – because it sounds absolutely amazing!! I would love to try the Spiced Fried Turkey ‘Nuggets’ recipe. The turkey and mushroom pesto burgers look amazing. I’ve been craving a burger for a while. I would love to try the Spiral Scaloppini. I would like to try the TURKEY TACO PIZZA looks very good!! The turkey and mushroom pesto burgers sound delicious and perfect for BBQ season. I would try the Turkey Taquitos sounds yummy ! I would love to try and make the Turkey Taquitos. I’d love to try the turkey club…looks so good! Spiced Fried Turkey ‘Nuggets’. To die for. Pick me, pick me! Your next winner!!! Show me the money!!! It would be a dream come true and means more to me than anyone else to win. Starving artist here desperately needs the $75 gc to shop and eat. Winner, winnner. Chicken dinner. A life changing experience. Top of my bucket list. Thank you for the awesomeness, the contest, and generosity. Dear Santa: I’ve been nice. My X-Mas wish this year is to win this contest. I would try the shredded turkey tacos. Another great recipe I would love to try is the SPICED TURKEY TARTLETS! I would like to try the Cherry-Orange-Stuffed Turkey Breast recipe. I’d like to try the GRILLED TURKEY AND MUSHROOM PESTO BURGERS! GRILLED TURKEY AND MUSHROOM PESTO BURGERS sound so good! I would love to try the GRILLED TURKEY AND MUSHROOM PESTO BURGERS because I am crazy for pesto! I would try the turkey taquitos recipe. BBQ Turkey Club with spicy mayo looks delicious. I like the Caesar Turkey Schnitzel Sandwich on a hot day with a beer. I would like to try the recipe for Bacon-Wrapped Turkey Bites with Cranberry-Chipotle BBQ Sauce. I would like to try the tur club with spicy mayo. The Turkey Nicoise Salad with Sundried Tomato Dressing looks so yummy! I would like to try The Best Grilled Turkey Thighs. The BBQ Turkey Club sounds good. The turkey nicoise salad sounds delish! The BBQ Turkey Club looks amazing! It’s the first one I saw but it certainly stands out as one I would try. I would love to try the turkey croque monsieur with cranberry-apple chutney, for a healthy take on a French cuisine favourite. Grilled Turkey and mushroom pesto burger would be delicious. The BBQ Turkey Club with Spicy Mayo looks awesome,I’d love to try it. I’d like to try the SWEET CHILI & LIME TURKEY MEATBALLS. The BBQ Turkey Club Sandwich with Spicy Mayo is definitely a recipe I will be trying soon! It looks delicious! I would like to try out the recipe for MOROCCAN SPICE-RUBBED TURKEY BREASTS. I Gould love to try the Turkey club sammie with spicy mayo! Yum! I would like to try the BBQ Turkey Club with Spicy Mayo!! Seems like a quick and delicious dinner idea!